Our Bronze Award... If you are thirsty your dog is too! 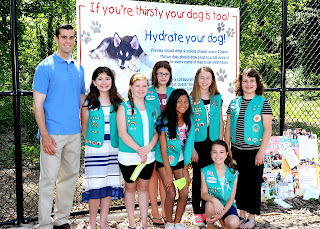 Plainedge Girl Scout Junior Troop #3456 started their Bronze Award project in June of 2013. Krystyna, Erica, Jessica, Sarah, Julia, Gianna, Natalia and Jacklyn decided that they wanted to positively impact the lives of animals. After much research, the girls decided to focus on making the world a better place for dogs. They wanted to permanently place water bowls in dog parks for people who forget to bring water for their dogs. They met with the owners of Marine Dog Supply. The Amato brothers helped the girls think their project through during a lively discussion. After evaluating the pros and cons of their idea, they decided that public water bowls may spread diseases. The girls hit the road again. Their next field trip was to the Last Hope Animal Shelter. There they learned that different breeds face different issues. For example, because of the facial structure of Pugs they take a very long time to drink a very small amount of water therefore requiring more frequent opportunities to drink. Dogs like this can and do die from dehydration. Their new direction became clear when they came up with a slogan---If you are thirsty your dog is too! Troop 3456 prides itself on communicating serious messages effectively with simple, light hearted logic. The girls wrote to the Town of Oyster Bay Parks and Recreation Department. Their response was that of true animal lovers. They donated two banners and televised the banner hanging ceremony in April 2014. Their banners hang in the dog sections of the Massapequa Bark Park. The girls secured PETCO as a sponsor after numerous e-mails and applications. PETCO emailed a gift card to purchase portable water devices for dogs along with a thoughtful note of support. You may be wondering why the girls wanted portable watering dispensers? They ran educational booths at Marine Dog Supply and the Massapequa Bark Park. They showed people the products available to make hydrating dogs easy and routine. They also designed and researched their own animal care pamphlet. One girl can change the world; one compliment can change a bad day into a good one! Teach girls what you know about the value of a compliment as they earn their It’s All About Friendship fun patch (patch can be purchased at the shop). The Long Island Water Conference (LIWC) and Girls Scouts of Nassau County (GSNC) re-introduced the “Every Drop Counts Patch” to teach Scouts the importance of their water supply. The patch can be earned by all levels of Girl Scouts and was sponsored by the LIWC to promote knowledge of the water industry and instill important messages of water conservation. Girl Scouts can earn this patch by completing a number of water conservation activities, touring or interviewing local water providers or planning and hosting a water protection community event. The Girls are encouraged to design their own water saving campaign, teaching their community ways they can conserve and protect Long Island’s water supply for future generations. The Long Island Water Conference (LIWC) is an alliance of 47 Nassau and Suffolk public drinking water purveyors, and other industry professionals, who supply potable water to over 3 million people. The organization is dedicated to ensuring that a clean, safe, and abundant water supply is maintained for all Long Islanders. Since its inception in 1951, the Long Island Water Conference has touched all phases of water supply and management in Nassau and Suffolk Counties. Members include the major water suppliers, both public and private, on Long Island. Together they serve virtually 90 percent of the bi-county area, which has a population greater than 20 states. The Girl Scouts of Nassau County are 27, 000 strong – 27, 000 girls and adults who believe every girl from Nassau County can change the world. It began over 100 years ago with one woman, Juliette Gordon “Daisy” Low, who believed in the power of every girl. Today, her vision of building girls of courage, confidence, and character who make the world a better place by helping them discover their inner strength, passion and talents lives on. And with programs in Nassau County, across Long Island and throughout the United States, there’s a chance for every girl to do something amazing. To volunteer, reconnect, donate or join, visit www.gsnc.org. The Bronze Award is earned by completing a Take Action Project, where you discover an issue or need in your community that you work on to improve. Don’t set up a project where you show no leadership. Each girl must take on a role in the Bronze Award project to make it happen. Don’t set up a project without a team, just working by yourself or just you and your parents. Bronze Award projects are team projects. If you do not have a troop team available to you, develop a team with friends your own age in your neighborhood. They would have the option to join Girl Scouting and earn the award themselves. Don’t plan a project that is less than 20 hours per girl minimum. Bronze Award projects are targeted at 20 hours per girl and you must plan for that amount. The 20 hours include all that you do in the Girl Scout Bronze Award Guideline to come up with your project idea. Don’t plan a project that is just collecting and donating items to an organization. Collecting and donating is a great SERVICE project but it is not to be used for the Bronze Award Take Action Project. Don’t find a project online that someone else did and copy it. You should be finding a problem in your neighborhood that needs fixing and developing your own project to fix it. Don’t put a few small projects together to make up the hours. The Bronze Award is one complete project not a set of smaller projects combined.